Brain haemorrhage. 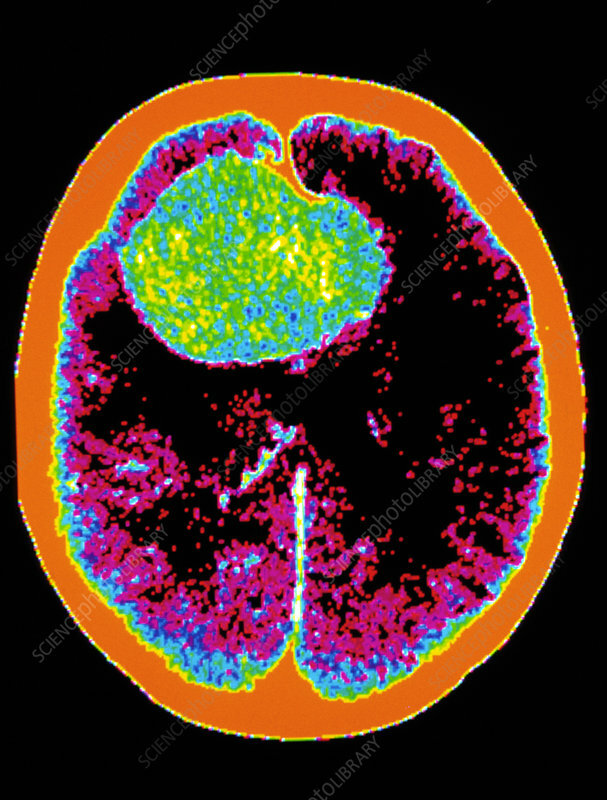 Coloured computed tomography (CT) scan showing a subarachnoid brain haemorrhage (green) caused by rupture of a cerebral aneurysm. This is a horizontal slice through the head. Brain haemorrhages occur when blood leaks from a damaged blood vessel in the brain. In this case the cause was a cerebral aneurysm - a berry-shaped swelling in an artery. The pool of blood has collected in the subarachnoid space - a gap between two of the membranes covering the brain. The condition causes symptoms similar to a stroke: paralysis of eye movement, rigid neck, headache & unconsciousness. About half those suffering a subarachnoid haemorrhage are ultimately killed by it.